We are proud to offer our customers a full line of your hitting and refueling needs. We have everything for baseball and softball hitting from bats to batting gloves to eye black to bat bags. We also carry a full line of drinks and snacks available to keep you energized as well. Not only do we match prices, we also include 3 FREE tokens with any bat purchase. We also make it easy for you if any warranty issues arise with the ability to email you a copy of the original receipt. Hitter’s Paradise will be giving 30 minutes FREE timed cage use for all 2018 Easton bats over $195! How are the online retailers going to top that? We match prices and give you 300 FREE pitches. Two-piece with X-tended barrel gives Ghost X a massive sweet spot. Speed one-piece carbon design w/ massive sweet spot. Balanced two-piece hybrid exact carbon/ATAC alloy. One-piece ALX50 military grade aluminum. Two-piece composite barrel with X-tended barrel design gives it the longest barrel in the game. Two-piece hybrid design combines the EXACT™ carbon handle with the ATAC alloy barrel for a slightly end-loaded but balanced feel. Easton’s #1 Backpack. External helmet holder for more space for equipment inside the bag with fence hook and separate vented shoe compartment. Holds 2 bats. Updated sport utility design with separate vented shoe compartment and interior shelf. Holds 2 bats. Little League World Series Camo design backpack with separate vented shoe compartment and interior shelf. Holds 2 bats. Sport utility backpack perfect for youth players gear. Easton’s #1 wheeled equipment bag. Huge main compartment with separate shoe panel and holds up to 4 bats. Sport Utility tote bag designed for the youth player with a main compartment for gear and a bat sleeve that holds 2 bats and equipment. 100% Polyester with open bottom hem opening. Available in Black, Navy, Red and Royal. 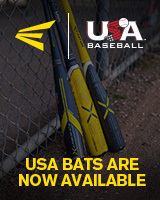 We also carry Bat Grip and Tape, Athletic Supporters, Helmets, Socks, new Baseballs, Wood bats, Bat Weights, Glove Lacing Kits, Pine Tar, Eye Black and Hitter’s Paradise shirts and hats!